Susan Hayward's Final Public Appearance. . Wallpaper and background images in the प्रतिष्ठित फिल्में club tagged: classic movies actress susan hayward charlton heston movie star. 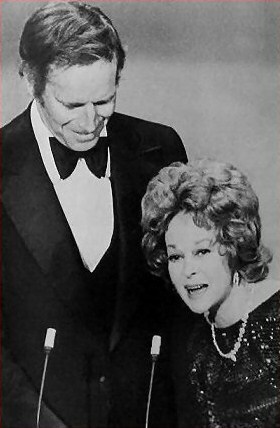 Susan Hayward surprised everybody in Hollywood by agreeing to be a presenter at the Academy Awards to be held in April. She and Charlton Heston (her co-presenter that night) they were to present the Best Actress Award. She appeared onstage clutching Heston's arm and was warmed with a very warm ovation and the camera kept a respectable distance and Susan looked so very beautiful from afar. What she did that night, her last appearance in front of a camera, was a bravura performance. Yet the extent of her bravery was not known until a few years ago. The afternoon of the Academy Awards, Nolan Miller, Hollywood`s famed designer, received a mysterious phone call from Susan, who said that she wished to come down to the Goldwyn studio to see him but would explain no more. Sitting alertly before him, she said, ''I am going to make a public appearance.'' ''You`re what?'' ''They asked me to be on the Academy Awards. What should I wear? How do you think I should look?'' Hollywood had learned quickly enough of Susan`s remission, and in March the Academy had sent her a formal invitation to appear live on television to present the 1974 Best Actress award with David Niven at the Oscar ceremonies on April 2. Her frequent seizures were no secret. The Academy people were well aware of the enormous risk of a grotesque fit in front of millions of viewers, but the spectacular effect of Susan stepping out of her deathbed to make a grand public appearance was apparently worth the potential horror. Susan was just as aware of what might happen, yet the idea of giving the Specter one good kick in the shins by appearing whole, perhaps even beautiful, in front of the millions who believed she was all but this, seemed irresistible. She had wavered for a few days, talked with Siegel, felt even more sanguine, then given the Academy a yes. Between the time of her acceptance and Academy Award night, she did not fare well. She underwent seizures, and her left side again was becoming paralyzed. What might happen in front of the TV cameras worried her to distraction. But on Oscar night Susan came through the side entrance of the Pantages Theatre wearing her $40,000 black sable. In her dressing room her retinue flitted about her, including Siegel, who gave her a big shot of Dilantin to prevent an on-camera seizure; Perc Westmore, doing a last-minute makeup check; Miller, fussing with her gown; and Katharine Hepburn, who became far more concerned about Susan`s big moment than she was about her own appearance. The Best Actor award had just been given and the dressing-room tension became nearly palpable as Niven appeared onstage, ready to introduce Susan: ''. . . and to help me present the award is someone very dear to all of us. She is no illusion. Ladies and gentlemen, Susan Hayward!'' ''Don`t stop for a moment when you hear that applause,'' Hepburn hurriedly whispered to Susan, knowing what the applause excitement might do to her, moments before Susan walked out into the hot television lights. She had pulled off the greatest theatrical stunt of her career and calling it a '' miracle of faith'' became terribly happy and excited--too much so. Fifteen minutes after she left the stage she suffered a gruesome seizure. Siegel did what he could. She was carried out of the Pantages on a stretcher. The contrast between the glamorous Hayward whom the world saw when she walked out in front of the Academy Award cameras and the ''remains'' that her friends saw in her dressing room was startling and not lost on her image-obsessed ego. She decided to capitalize on the mirage she projected to millions by having Jay Bernstein and her son, Timmy, proclaim to all the columnists that she was not only cured and nearly ready to work again but also never had had cancer in the first place. Newspapers repeatedly ran items about her recovery. Pictures accompanying the articles were of a flawlessly beautiful Susan at the Oscar presentation. So effective was the campaign to change Susan`s image from that of one who was dying to one who had been victimized by erroneous cancer reports that the TV networks began sending Susan scripts. Then Susan actually agreed to do a TV pilot to be filmed in 1975. She was beginning to believe her own publicity. Ten months later, on March 14, 1975, Susan had a massive seizure and died she was age 57.